Draft: 2012, Arizona Diamondbacks, 3rd rd. Jake Dalton Barrett...Attended Arizona State University from 2010-12 and went 11-8 with 13 saves and a 3.38 ERA, including a 1.62 ERA and 11 saves as a junior…2012 Pac-12 All-Conference honorable mention and Baseball America Preseason Second-Team All-American ...Is a 2009 graduate of Desert Ridge High School in Mesa…named 2009 Arizona State High School Player of the Year and First-Team All-State in 2008-09…led Desert Ridge to the 2009 5A-2 State Championship…set Arizona high school records with 19 home runs and 65 RBI in 2009...Selected by Toronto in the third round of the 2009 First-Year Player Draft but did not sign... Signed by Matt Smith (D-backs). Appeared in 28 games over 2 stints with the D-backs, going 1-1 with a 5.00 ERA and 26 strikeouts ... Held the opposition scoreless in 19 of his 28 outings ... Limited left-handed hitters to a .238 average (10-for-42) with just 4 extrabase hits (all home runs) ... On 10-day disabled list from start of season-May 11 (right shoulder stiffness) ... Was 2-0 with 3 saves and a 4.91 ERA in 20 games with the Aces…held lefthanders to a .139 average (5-for-36). Went 1-2 with 4 saves and a 3.49 ERA (23 ER in 59.1 IP) in 68 games with the D-backs in his first Major League season...Ranked third among NL rookie relievers in saves, tied for third in appearances and was sixth in ERA...Finished among the franchise rookie reliever leaders in several categories: appearances (2nd), opponents average (4th, .218), saves (5th), strikeouts per 9.0 IP (5th, 8.49), strikeouts (6th, 56) and innings (7th)...Limited right-handed hitters to a .214 average (27-for-126), including holding them hitless over his final 13 appearances and 23 batters faced (0-for-21)...Went 1-1 with 2 saves, a 1.93 ERA (6 ER in 28.0 IP) and a .175 opponents average vs. NL West opponents...Made his first career Opening Day roster before being optioned to Triple-A Reno on April 17…recalled from Reno for the remainder of the season on April 28... Earned his first Major League save May 20 @ Cardinals…col-lected his first Major League win on July 2 vs. Giants...Finished the season with a career-long 12.2 inning scoreless streak, and 13 scoreless appearances. Saved 15 games between Triple-A Reno and Double-A Mobile and went 4-3 with a 4.58 ERA (27 ER in 53.0 IP) in 47 relief appearances…Placed on the temporarily inactive list from July 4-21 while helping Team USA earn a silver medal at the Pan Am Games in Toronto…did not allow an earned run over 4.0 IP…Entered the season ranked by MLB.com as the No. 11 prospect in the D-backs' system and No. 12 by Baseball America. Combined to go 3-2 with 29 saves and a 1.21 ERA (7 ER in 52.0 IP) and 59 strikeouts in 47 relief appearances with Single-A Visalia and Double-A Mobile...Cited by Baseball America as the Best Reliever in the California League...Finished seventh in the Minor Leagues in saves...Named to the CL midseason All-Star Team...Limited opponents to a .197 average (39-for-198), including a .154 mark by righties (19-for-123)...15 of his fi rst 16 outings were scoreless (1.13 ERA; 2 ER in 16.0 IP)...Ended season on a 14-game scoreless streak (14.2 IP)...Made 3 scoreless postseason appearances with 3 saves for Mobile (4.0 IP)...Played with Salt River in the Arizona Fall League and was 1-0 with 4 saves and a 6.23 ERA (6 ER in 8.2 IP)…participated in the AFL Fall Stars Game. Made his pro debut with Single-A South Bend and was 0-3 with 6 saves and a 5.84 ERA (16 ER in 24.2 IP). April 4, 2019 New York Yankees claimed RHP Jake Barrett off waivers from Pittsburgh Pirates. 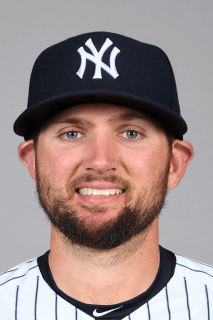 April 4, 2019 New York Yankees optioned RHP Jake Barrett to Scranton/Wilkes-Barre RailRiders. March 28, 2019 Pittsburgh Pirates designated RHP Jake Barrett for assignment. March 20, 2019 Pittsburgh Pirates optioned RHP Jake Barrett to Indianapolis Indians. March 1, 2019 Pittsburgh Pirates claimed Jake Barrett off waivers from San Francisco Giants. February 22, 2019 San Francisco Giants designated RHP Jake Barrett for assignment. February 5, 2019 Arizona Diamondbacks traded RHP Jake Barrett to San Francisco Giants for cash. January 31, 2019 Arizona Diamondbacks designated RHP Jake Barrett for assignment. September 19, 2018 Arizona Diamondbacks recalled RHP Jake Barrett from Reno Aces. June 24, 2018 Arizona Diamondbacks optioned RHP Jake Barrett to Reno Aces. June 20, 2018 Arizona Diamondbacks recalled Jake Barrett from Reno Aces. June 5, 2018 Arizona Diamondbacks optioned RHP Jake Barrett to Reno Aces. June 2, 2018 Arizona Diamondbacks recalled Jake Barrett from Reno Aces. May 12, 2018 Arizona Diamondbacks optioned RHP Jake Barrett to Reno Aces. May 11, 2018 Arizona Diamondbacks recalled Jake Barrett from Reno Aces. March 10, 2018 Arizona Diamondbacks optioned RHP Jake Barrett to Reno Aces. October 10, 2017 Jake Barrett roster status changed by Arizona Diamondbacks. October 4, 2017 Arizona Diamondbacks reassigned RHP Jake Barrett to the minor leagues. August 22, 2017 Arizona Diamondbacks recalled RHP Jake Barrett from Reno Aces. August 14, 2017 Arizona Diamondbacks optioned RHP Jake Barrett to Reno Aces. July 6, 2017 Arizona Diamondbacks recalled Jake Barrett from Reno Aces. May 11, 2017 Arizona Diamondbacks optioned RHP Jake Barrett to Reno Aces. May 11, 2017 Jake Barrett roster status changed by Arizona Diamondbacks. April 29, 2017 Arizona Diamondbacks sent RHP Jake Barrett on a rehab assignment to Visalia Rawhide. March 31, 2017 Arizona Diamondbacks placed RHP Jake Barrett on the 10-day disabled list. Shoulder injury. April 28, 2016 Arizona Diamondbacks recalled RHP Jake Barrett from Reno Aces. April 17, 2016 Arizona Diamondbacks optioned RHP Jake Barrett to Reno Aces. November 20, 2015 Arizona Diamondbacks selected the contract of Jake Barrett from Mobile BayBears. July 21, 2015 Mobile BayBears activated RHP Jake Barrett from the temporarily inactive list. July 4, 2015 Mobile BayBears placed RHP Jake Barrett on the temporarily inactive list. June 8, 2015 RHP Jake Barrett assigned to Mobile BayBears from Reno Aces. February 13, 2015 Arizona Diamondbacks invited non-roster RHP Jake Barrett to spring training. June 15, 2014 RHP Jake Barrett assigned to Reno Aces from Mobile BayBears. January 8, 2014 Arizona Diamondbacks invited non-roster RHP Jake Barrett to spring training. June 27, 2013 RHP Jake Barrett assigned to Mobile BayBears from Visalia Rawhide. March 30, 2013 Jake Barrett assigned to Visalia Rawhide from South Bend Silver Hawks. February 28, 2013 RHP Jake Barrett assigned to Arizona Diamondbacks. June 13, 2012 Jake Barrett assigned to South Bend Silver Hawks. June 9, 2012 Arizona Diamondbacks signed RHP Jake Barrett.